Personal Watercraft can provide a lot of fun activities around the waterways with friends or family. Since the early 70’s when Kawasaki came out with their Jet Ski brand, people have been using personal watercraft for pleasure and also for work in increasing numbers with a number of other manufacturers including Yamaha and Bombardier with their Sea-Doo helping to contribute to that popularity. Whether on flat water, ocean or in the waves, PWC’s are a versatile vehicle and as a result have been increasingly used in situations where small motorboats have difficulties like for surf rescue, Coast Guard and Navy, fishing and even for racing. Increased popularity can also increase its dangers with injuries and deaths occurring. Guidelines and laws have been implemented in many areas to minimize these issues, some waterways banning them completely. Another hazard can be due to mechanical issues which may result in falls, collisions or becoming lost and stranded as a result of engine failure or starting issues. A dead or low battery can certainly leave you in an unenviable position of not being able to return to your destination. A PWC battery should last around 3-5 years but there can be other factors that will reduce that number which is usually to do with how you maintain it. Typically if you’re not using it, you want to keep it charged or intermittently charge your battery especially during winter. Follow the charging directions as they can vary plus you also want to be careful not to overcharge the battery. The last thing you want when you go for your first run of the season is to hear the dreaded clicking sound and then have to figure out where to recharge it. Do not use your car battery, it will overcharge your system and fry your electronics so make sure to use your battery charger or a smart battery charger. Solar battery chargers can also be useful in more portable situations where you may not have access to power or are close to water. Also keep in mind that unlike car batteries, your PWC battery won’t charge when you use it so if it keeps having issues, there may be something more significant, perhaps a broken charger, sulfating, bad cables or just an old battery especially if it’s been around 3 years. The best battery you can get for your PWC is an AGM Battery. These can handle a lot more abuse than the regular lead acid batteries. They’re also ready to go so you don’t need to have to think about filling it or charging it. You’ll need to figure out the best replacement option. Often you’ll see a model number on that actual battery. Sometimes you can search by the actual watercraft model and that will help to direct your search. 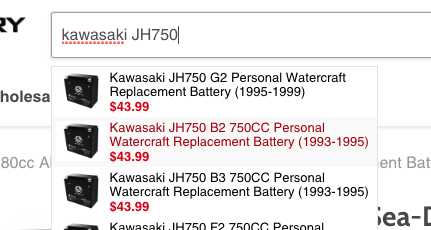 If you search on batteryclerk.com for Kawasaki JH750 for example you’ll be presented with several options, which you can refine by year and specific model. Keeping your PWC running is top priority especially with warmer weather coming and the covers starting to come off your favorite PWC. Make sure to check your batteries so you can get going as soon as you hit the water.